The Grandwich reviewers take on eight more sandwiches and have their faith restored. With a better selection overall, San Chez came out on top. And Day Two's review here. "Half pound Angus burger with slow cooked pastrami, double Swiss, homemade Kapusta and Dijon mayo on a fresh brioche bun." "Thinly sliced local cuban style pork, the Cheese Lady leyden cheese, spicy purple Farmer’s Market cortido slaw, creamy garlic & lime aioli, fried green tomatillos, in a toasted locally-sourced cuban bun. Served with choice of house cut fries, tortilla chips, soup, or salad." "Bacon, Bleu-Jack and gouda cheeses, fresh roasted onion, peppers, and tomatoes, and served on grilled rye swirl bread with cottage fries." "Sliced Marinated Skirt Steak with Hop-Pickled Asparagus, Charred Radicchio, Mashed Sweet Potatoes, and served with Smoky-Horseradish Mornay, atop a freshly baked, toasted Telera Roll from Nantucket Bakery"
"Sixteen hour smoked brisket slapped with our signature BBQ and topped with smoked Gouda, slaw and served on a toasted pretzel bun"
"Grass Fed Ground Bison stuffed with Spinach and Boursin, topped with Fried Tomato, Sautéed Onions, and Fresh Peppers on a Soft Brioche Bun. Served with Pickle Fries." 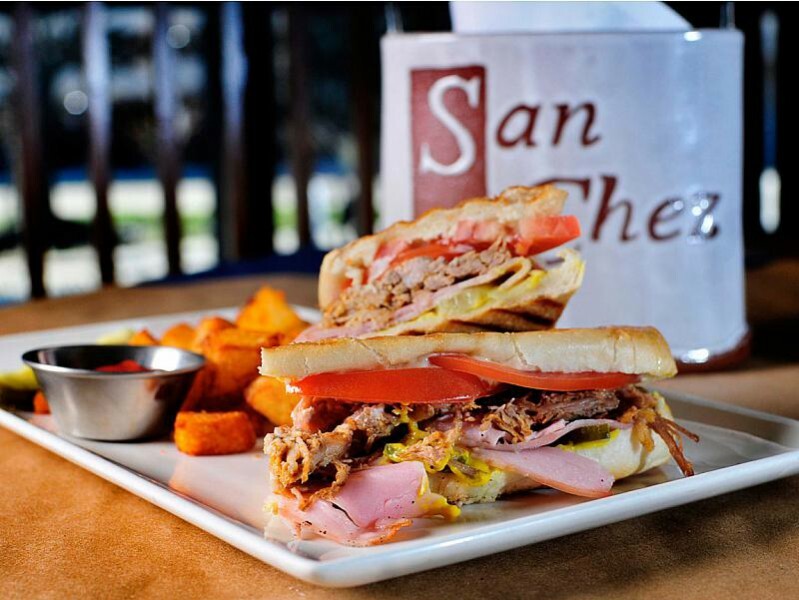 "Our special take on the traditional cuban which includes braised mojo pulled pork topped with dill pickle, Sanders Farm Ham, fresh tomato, emmentaler, yellow mustard and garlic aoili. The bread is actually the chef's spin on a crescentina, a fried bread that's popular in Northern Italy (Bologna region)." "Slow roasted Founder’s Imperial Stout braised beef pot roast, served on thick sliced, butter grilled fresh baked bread from The Coral Bakery and Bread Co. This open face sandwich and our homemade roasted garlic mashed redskin potatoes are smothered in the perfect homemade beef pan gravy and topped with haystack onions and carrots." It is day three of our Grandwich review and after a change of venue to the outdoors we were all hoping for something good from our eight sandwiches. At this point the bar has been set pretty low. Day one: Let’s find a sandwich we would want to order again. Nope. Day two: Let’s find a sandwich that we might want to actually finish. Barely. Day three: Let’s find a sandwich that we would want to take a second bite of. Well, the good news is day three delivered a much better and tastier selection. If you are a Calvinist, this is the redemption part of the creation and fall. If you like movies, this is act three where it is revealed that the hero isn’t dead after all. If it was a children’s tv show ,this is the part of the show where Steve finds all of Blue’s clues. Needless to say these sandwiches restored my faith in part. Now, on to the reviews. At first glance I felt my head start to ache, remembering the meat migraine I suffered from the previous day’s grandwiches (I am looking at you Stella's and HopCat). Rarely did we take more than two bites of any of the sandwiches, but the offering from San Chez is one we wanted to finish. With a bread recipe from Italy, braised mojo pork and Sanders Farm ham, the Cuban Pork Mojo from San Chez was a favorite of the day. It is a solid Cuban sandwich that hits on all the right flavors and the only real improvement would be to add a little more garlic aioli. San Chez has had good Grandwiches in the past, and this continues their streak. Viva La Cuba. Verdict: Best sandwich of the day; second overall, and in the words of Oliver Twist, “Please sir I want more… Cuban Pork Mojo.”* The sandwich does not come with sides. 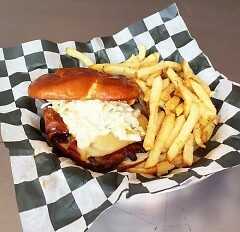 The Garage Bar and Grill offers a solid BBQ brisket sandwich. The smoked brisket with smoked Gouda - yes, this sandwich is up to two packs a day - and their signature BBQ all have good flavor. The sandwich comes with an order of tasty fries for under 10 bucks. This sandwich was our second best of the day, and in a day with so many good sandwiches that is saying something. But for a Grandwich one would except a little more. There was no wow - nothing that says I would drive two hours for this. *No reason for this as I just don’t like even numbers, but show me the research that says 16 is the magic brisket number. The Cheshire Grill brings a taste of thanksgiving to the Grandwich with Granny’s at the Grill, an open face sandwich using slow roasted Founder’s Imperial Stout braised pork roast with roasted garlic mashed redskin stacked with haystack onions. It’s tasty and good, but just make sure if you get a little of everything in the bite. Needless to say, sandwich or not, I liked it. I wanted to eat more of it. I will order it the next time I am at The Cheshire Grill. Verdict: Home cooking, Thanksgiving comfort food, a sandwich that tastes best with everything in one bite. John Montagu may be rolling in his grave. While the Westside Polish Pastrami from Blue Dog Tavern, with its half pound of angus beef and slow cooked pastrami that looked like it would sink me into a meat coma relapse, the burger was objectively tasty. The word “objectively” is used here because not everyone enjoyed the sandwich, one comment being “surprised I didn’t dislike it more.” That's hardly high praise, but it was understood that others would enjoy it. I put myself in that category. Verdict: A sandwich my dad and carnivores would like, but buyers beware, this one should come with a surgeon general’s warning regarding meat overdose. Founders offers many fantastic sandwiches on the their menu, but the Skirt Steak Sandwich with sliced marinated skirt steak, mashed potatoes and a promise of Smokey-hoseradish mornay created this internal conversation. We expected more flavor from this sandwich and many asked, “Where is the horseradish?” Either there wasn’t enough, or none at all on the one tasted. For a sandwich that costs $11.75 we were unimpressed. Verdict: Looks great, could use a side, not a lot of flavor and otherwise inoffensive. Remember when we nearly wiped bison from the Great Plains? I don’t remember it either, and I am also having a hard time remembering the Grand Woods Lounge Grand Bison Burger. The grass fed ground Bison stuffed with spinach and boursin, which I learned is a lot like cream cheese, was not memorable. On the other days of Grandwiches this may have fared better, but the lineup today puts this sandwich toward the bottom among our reviewers. Some called it sour tasting and weird, and “God pickle fries.” While I didn’t hate it and would eat it, I wouldn’t go for seconds. “Lucy I am home.” The Ricky Ricardo from CitySen Lounge is a thinly sliced local Cuban style pork, with “Cheese Lady Leyden cheese,” curtido slaw, and garlic. The bread tastes cheap, the meat was grisly, and overall the sandwich was bland. The slaw on the side was good on its own, but it’s the sandwich that is a letdown- especially considering earlier years' offerings from them, according to one of our reviewers. Like the failure at the Bay of Pigs, this planned flavor invasion was best left on the drawing boards. Verdict: Bring a toothpick to get the meat out of your teeth; not good. When I was a child I loved grilled cheese because of the cheese. Now imagine my delight when I heard that Cottage Bar had the Loaded Grill Cheese with bacon, bleu-jack and gouda cheeses on a rye swirl bread. Well… it’s like this. If you call something a Grilled Cheese make darn sure you aren’t left saying, “where’s the cheese.” The taste of the sandwich was all green pepper and bacon. It was bland and a disappointment. This sandwich was considered the worst of the day. Verdict: The second grilled cheese grandwich that caused me to hate my childhood. While this selection of Grandwiches were certainly the better of the bunch, the best of the sandwiches didn’t really excite me. Even the best of the day didn't leave me wanting more, and none of them left me thinking that Grand Rapids restaurants are anything but average. I love the food movement in Grand Rapids, and the Grandwiches are a step in the wrong direction. That doesn't not mean we are right. I fully understand sampling a sandwich as take out is not the definitive way to eat it so please take what we say with grain of salt, and try them for yourselves.